This is a follow-up on a previous post on Farmers Markets. This post has come around mainly from watching other stall holders and how they deal with sales that walk past their stalls. What must be remembered is that people come to markets to spend money. Here is something you might not realise, “They Actually Have Money to Spend!” It’s up to you to excite them, when people are excited they are more inclined to spend that money with you. A very common complaint that my wife has at markets is that they are often full of cheap trash, she has often popped out to a market to purchase a gift and come back empty handed and disappointed at the quality of the goods on offer. 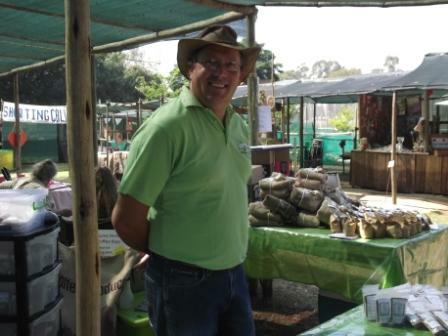 The decision to have a stall at a farmers market is pretty easy, and generally one can get away with a couple of hundred Rands in initial investment. It’s making the sales that seems to be the hardest part! I’ve seen people with good quality perishable goods that should be selling quickly, have a disastrous day. At the end of a whole day sitting in gloom, they grumble that the food is going home to feed pigs…. meanwhile, they should have sold out. I believe that there are two MAIN hurdles that people need to overcome when looking at farmers markets. The first is what to sell. This is one of the continuous questions that I hear from people that want (or need) to make an additional income. My advice is generally to visit your local markets and just watch. Don’t watch what the stalls are selling. Watch where the people are spending time AND money. These are the stalls that are selling something that’s in demand. NOW look at what they are selling, take note of a few things. The first thing you will see is that the stall is probably full of produce / product. There is excitement on both sides of the stall and the person selling is typically talking loud enough so that passers-by can pick up on the conversation. It does not really matter what the products are, but it’s generally fresh, new, exciting, upbeat and LOCALLY PRODUCED. Either by themselves or another local person or farmer. My list of fast selling lines are. What needs to be remembered is that people are looking for something that has a story, so tell them one, and tell it over and over again. Just as long as it’s the truth. People want value for money, and they want to enjoy their purchase. People also like telling their own story of how they ‘found you’. If you are selling a consumable item and it’s a great product, they will probably share your goods with guests, as well as your story and that’s how you develop a name. Selling DVD’s at a farmers or craft market is not what people are looking for, if they want to buy illegal copies of new movies they will buy it at the Zimbabwean on the first street corner or PS2 Games from the Malawian at the second one. They also did not come to visit their local China mart stall, don’t try sell junk guys, people can see through you. People come to the market to try something new, so your Herb Leaf Salad pack that really IS a Herb Leaf Salad pack is going to rock their palates this evening and they will be back for more next week. Those stunning unusual veggies or flowers will be taken home, because you used special seed or they are old unique varieties that are not available anywhere else. Early morning at the Wyetti Market, notice our well stocked stand. Our fellow stall holders behind have already settled in for the day. They had fantastic baked goods, but never sold enough to make it worthwhile. The second hurdle is: Actually doing what you paid money to do in the first place…. selling! Successful stalls NEVER have a chair for the stall holder to sit on. I have watched fellow stall holders at a number of markets over the last year, the main deterrent to a prospective buyer is a stall holder that is sitting down or chatting to another stallholder. The act of you sitting down prevents prospective customers from casually approaching you, because you are busy….. busy sitting and doing nothing. I’ve seen people, reading, knitting, eating, or just sitting glumly behind their stalls. If you are going to sit down, rather do it at home where you don’t have to pay for the privilege. Another thing is talking to other stall holders. Now don’t get me wrong, be friendly and and show and interest in them, as they will assist you with your stall when you are short staffed or need to run to the loo, or vice-versa. But don’t strike up a full length conversation and ignore the feet walking past. Stop those feet and talk to them instead. If you are a smoker. Don’t smoke at your stall, no matter what your belief is about your right to smoke. And please don’t walk away from your stall to smoke, and them come and smoke at my stall! I tend to lose my sense of humour, as your smoke chases my customers away. I might just make you buy something. My wife, eldest daughter and I run 2 separate stands at our local market, we sell our seeds and seedlings as well as a separate stand that sells fresh filter coffee by the cup. We have a rule that at least one of us is outside the stand engaging customers, talking to passers buy and generally being affable. 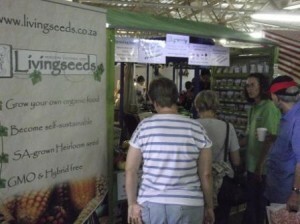 My wife Nicola (in the green) talking to a customer outside the stand. Other potential customers are listening in. Our method is simple, and it’s as follows. Touch, Pause, Engage and Pass. Touch with a word or two to spark interest. Pause to see if there indeed is interest. Pass the customer to the team mate behind the stand, if they are busy then help that customer yourself. What this does is creates foot traffic and excitement at your stand, that excitement draws more customers. When things quieten down, then start again. Touch, Pause, Engage, Pass. Farmers and Craft Markets are only as good as the stall holders, and they are the people that make the “vibe” of a market, if you guys are all glum and grumbly, don’t expect customers to cheer you up or spend money with you. Being upbeat, having a smile and engaging with people all contribute to better sales. It’s easy and cost nothing. You are going to spend the day there anyway, so rather do it with a smile and come home with full pockets. ← Using the O word. Thank you for that information. I always wanted to start selling at a farmers market and since it seems that my contract will not be renewed, it may just become a reality. I will definately read it again and then try it. love the descriptions of a successful marketer and yes that ‘chair syndrome’. Have been a marketer for many years and what an amazing place to train youngsters with a skill for life. Put my two boys through the exercise and a few others and it is like watching a flower bloom. And boy do they know how to milk a willing customer.